He's quite the loner isn't he? 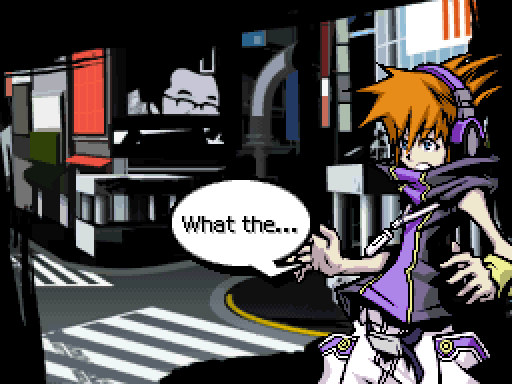 But strange things are happening today, after he mysteriously wakes up in the middle of a busy intersection. : I can hear voices in my head! What just happened? Just a reminder, italicized text is thoughts. 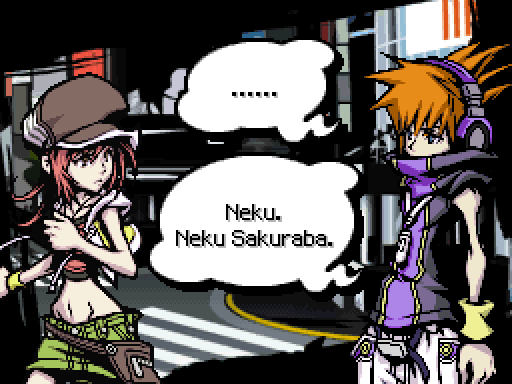 Neku does switch from speaking to thinking his monologue sometimes. Already, we get our first gameplay feature, scanning. 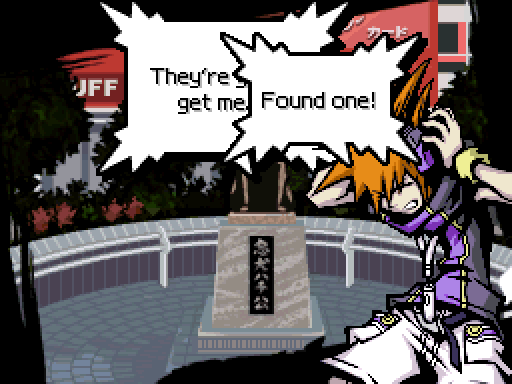 You run around area maps by touching the spot you wish to go to, pressing the directional pad, or with the XABY buttons. 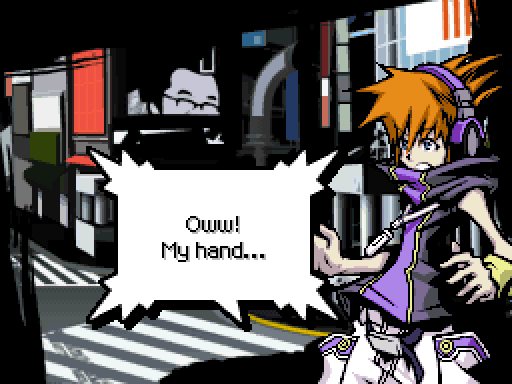 TWEWY cares about the lefties in the audience. Anyway, let's get to scanning. For the most part, scanning is used to read random people's thoughts. 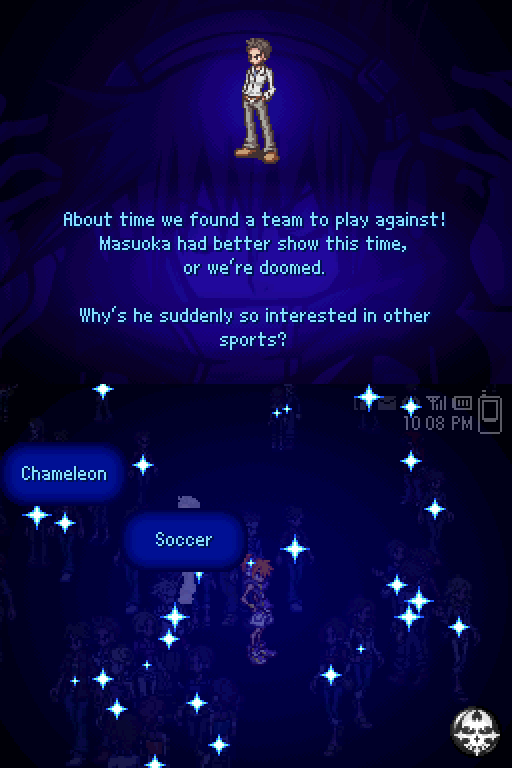 Some of these are funny, some form narratives as the game progresses. I'll give the random ones their own updates. : Voices! Definitely voices! But why? Am I hearing peoples thoughts!? What the hell IS this pin? : Oh, thats cute. See ya, spam. Deleted. He looks at his phone again. : Huh? Still there... Its like the junk mail from hell. Suddenly a flash of light! Strange frogs, with intricate tattoos for rear legs, appear! : What do they want with me? I take the chance to get comfy with movement again before I retreat. Thankfully this battlefield is large enough that I can zoom around pretty freely. 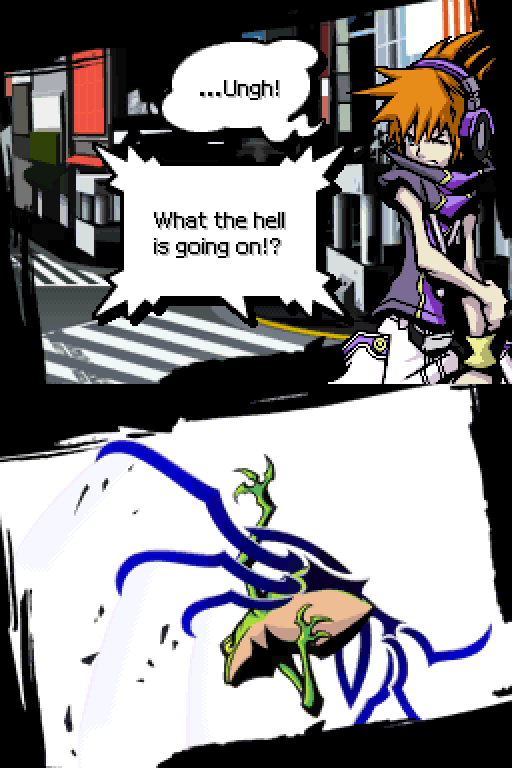 Neku has invincibility frames at the start of his dash, which I show off. With no way to damage the frogs, there is no choice but to flee. Most new gameplay features give you two items, a "sticker" which technically enables the ability, and a book telling you how it works. I'll be cutting out most of them. No one notices his plight, or even the frogs at all. : Crap! I gotta run! If you have no idea what's going on, that's because most of the imagery is of characters we haven't met yet, both good and bad. It's mostly there for the music, I guess. 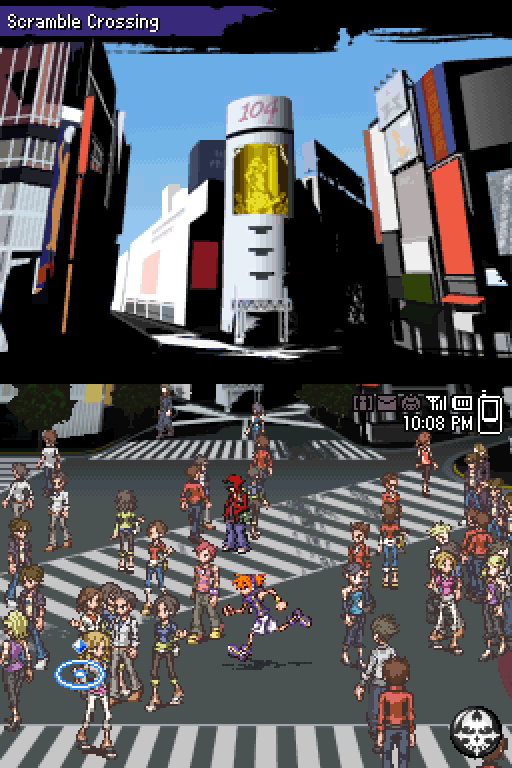 After that cutscene, we cut to two figures, male and female, on the rooftop, conveniently obscured by shadow. The effect his honestly rather pointless as 1)the black wings are ominous enough and 2)They were seen without the shadow in the cutscene that just played. : Stop whining. We havent had work in, like, forever. : Exactly. It feels like the Monday after vacation. : Youd prefer a permanent vacation? Day 1 has the most Players. Nows our chance to rack up some points! How else you gonna make up for last month? : Aight, aight... One week wont kill me. Probably. Hey, while were at it... How bout we play a little game? : Yeah, so it doesnt feel so much like work. Cmon, you love it. : Oh, yeah. You know me. Sigh... All right. : Lets see who bags the most Players during todays mission. : Are you joking? Thats no fun at all! : You dont like it? : But Im gonna crush you! Theres no contest. : Ohh, zing! Now I have to actually try. You know the drill. Loser buys winner a hot bowl of ramen. 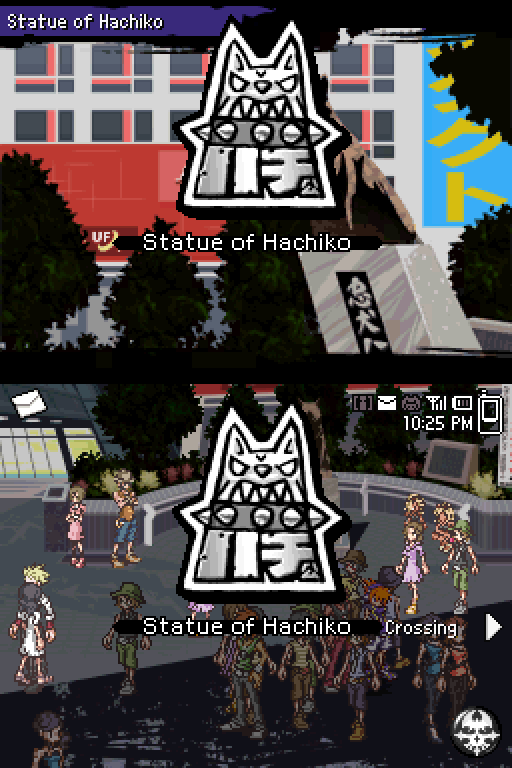 We cut back to our hero as he flees to the Statue of Hachiko. Screen transitions net you a graphic of the area you have arrived at. That's how he catches his breath. Get used to it. : I didn't do anything to you! 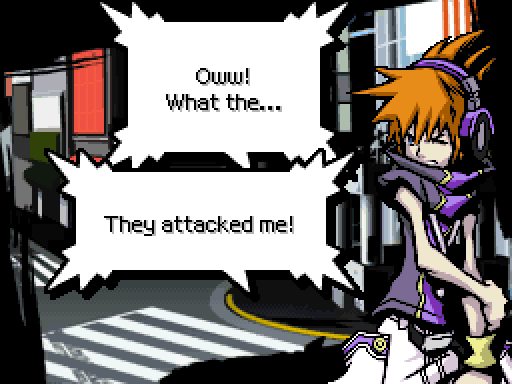 But then he sees the oddest sight, other people being attacked by the frogs! 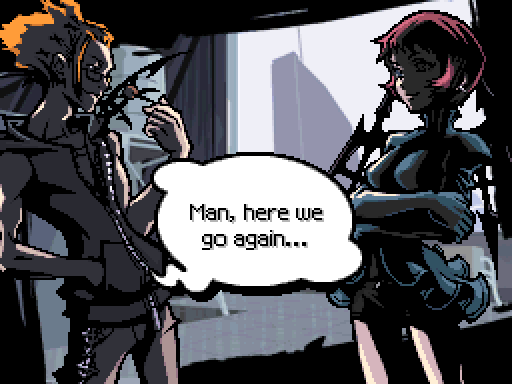 Seriously what is it with this game and its really short cutscenes in the first day. : They vanished! Why are people disappearing!? : Listen! If we forge a pact, we can beat the Noise! : Who cares about a little noise! : You wanna be erased? Hurry up! 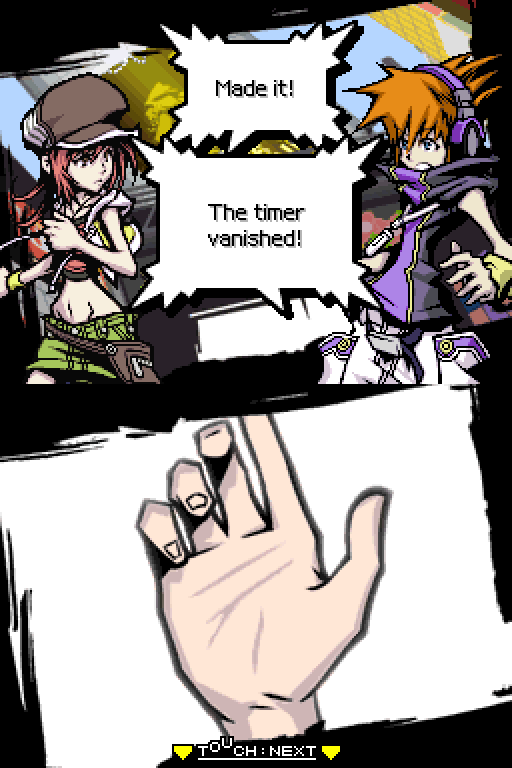 Theres no time! 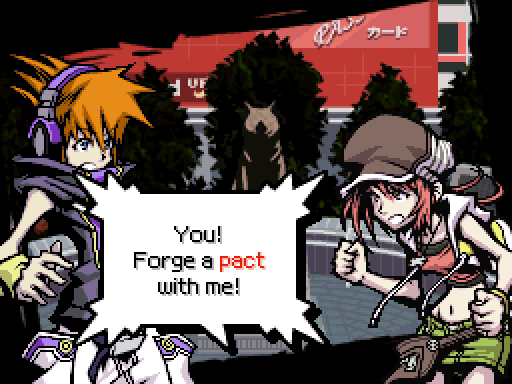 Make a pact with me! Please! If they look cut off at the torso, that's because... They kinda are. 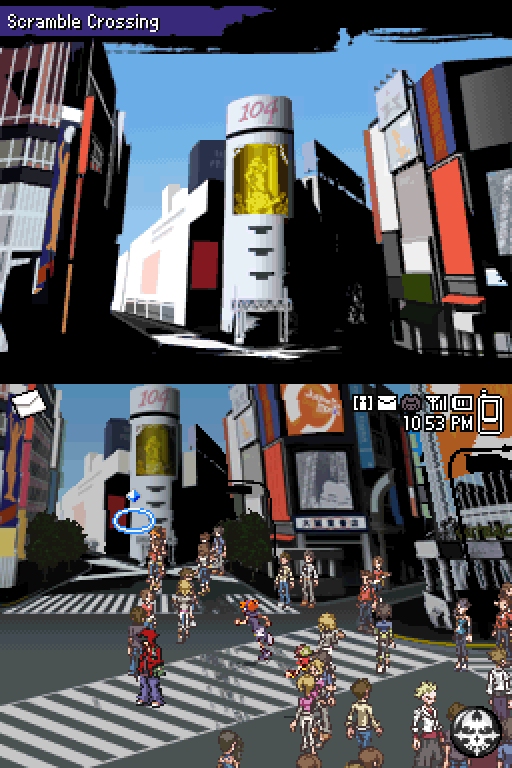 This cutscene was designed with the gap between the DS's screens in mind, so the middle is cut out. 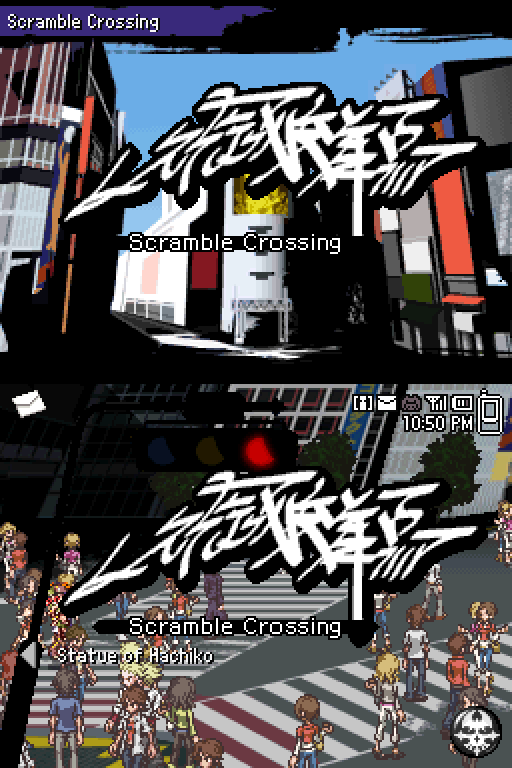 The strange thing is, the previous cutscenes with with cross-screen images don't, so they look weird on an actual DS. Gah! 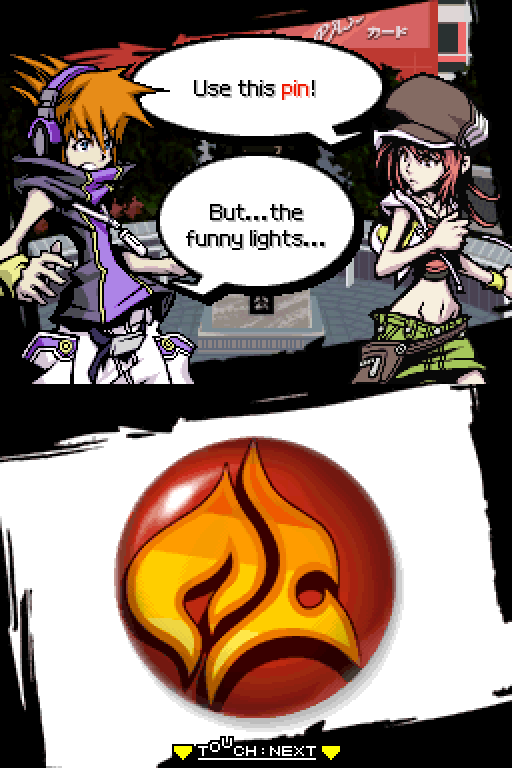 She hands him a red pin with an orange flame graphic. : Ill explain later! Right now we have to stop the Noise! 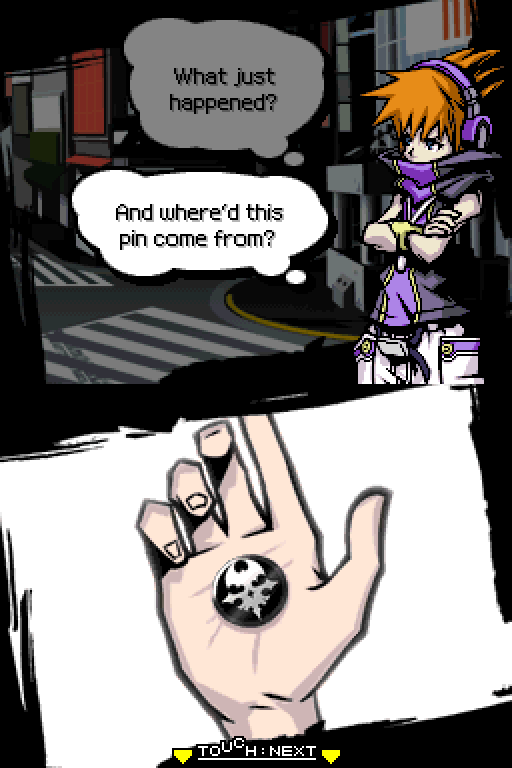 So for the first battle you can win they give you an incredibly crummy pin. Pyrokinesis is a basic unbranded pin with the... Pyrokinesis psych. With boot and reboot times longer than its actual use, it's not terribly exciting. 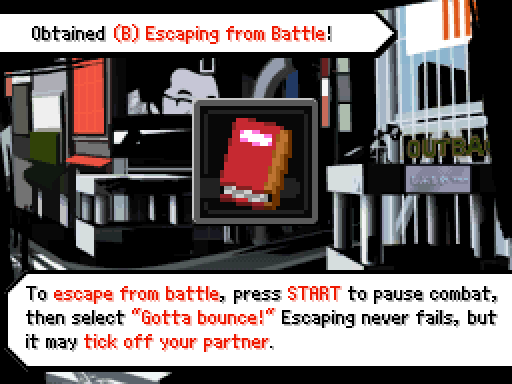 Also the absence of the HP bar suggests that you can't actually lose yet, but I've never been hit enough to see. : Whoa! 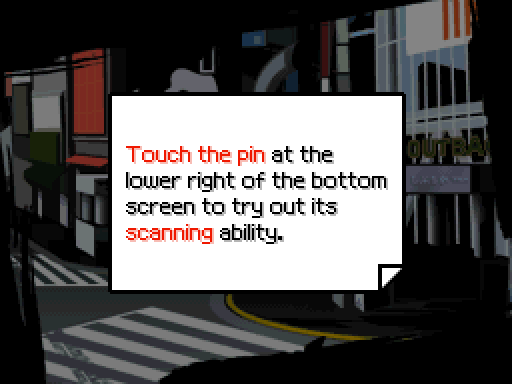 You can use the pin? 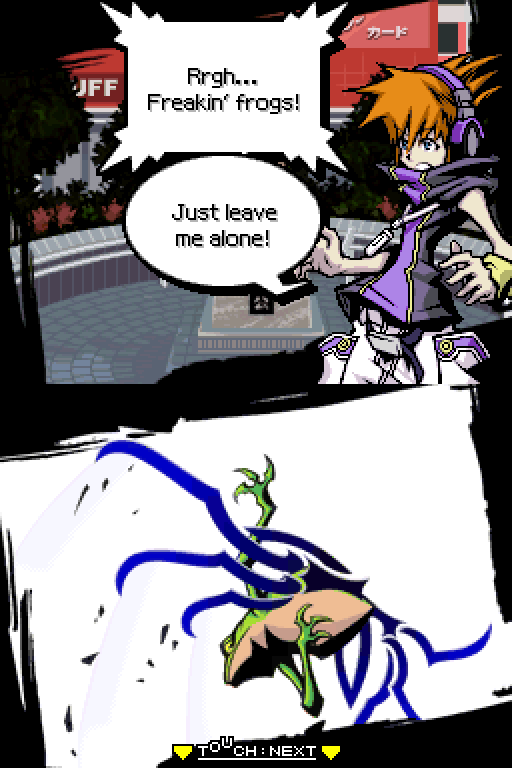 You must be really good at psychs. Guess I found the right partner, huh? 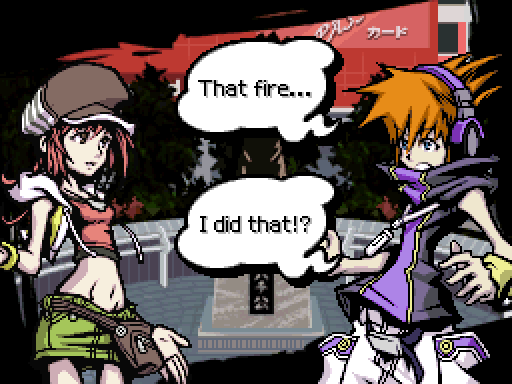 ]: Thats what you call those flames? A psych? : Yup. And now that weve made a pact, the Noise wont come after us! : In other words, were safe. : Right. See? All gone. : All gone. So...What are Noise? : Theyre the monsters we just fought. Duh. : And "psychs"? That what this pin is for? Finally we have her name. It's kinda rough having to narrate things without actually using names. : I call this wack. : Weve got a long week ahead of us! : A week? Week of what? 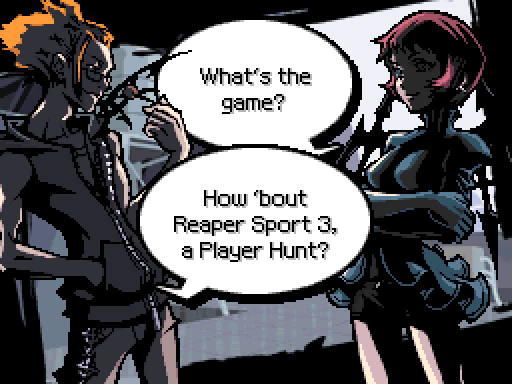 : The Reapers Game is seven days long, right? : Reapers? Excuse me? Who is this flake? : So whats your name? : Forget her... Where am I? How did I get here? : Cmon, tell me your name. 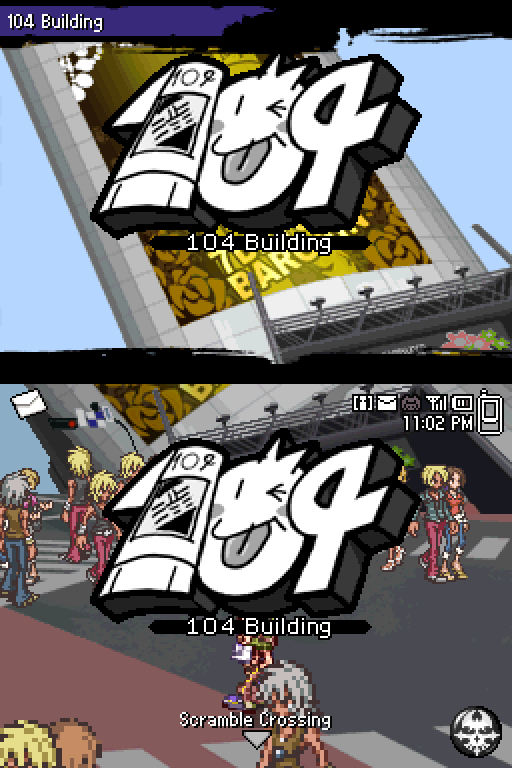 : The sign says "Shibuya Station"... Why am I in Shibuya? : Wait... the intersection. I just need to retrace my steps. 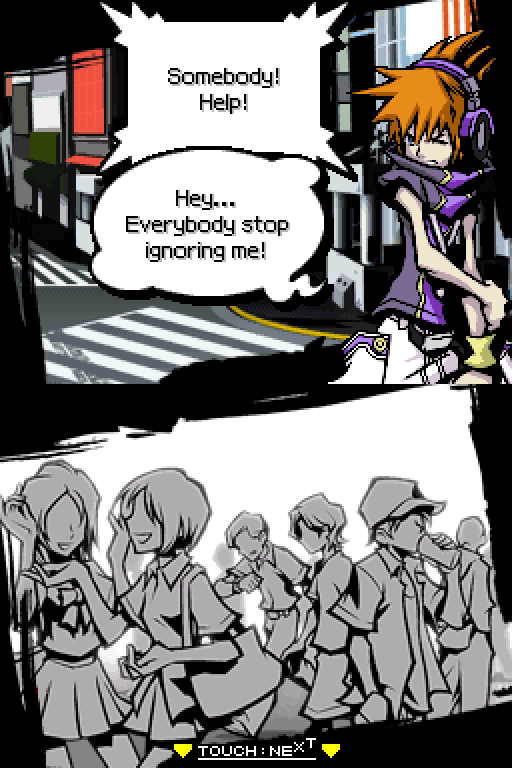 Anyway, Shiki's following him and he freaks out. : Why are you following me!? : Why are you making yourself so hard to follow? : Screw you. I go where I want. : Go where? Were trapped in here! : What? Dont be stupid. : Youre the one being stupid. We made a pact. Were supposed to stick together! You cant beat Noise alone. You cant survive! : The Game! Dont you wanna win? : Pfft. Play games on your own time. : Hey! Thats not funny! Theyll erase us if we dont win! You saw what happened to those people! You wanna join them? 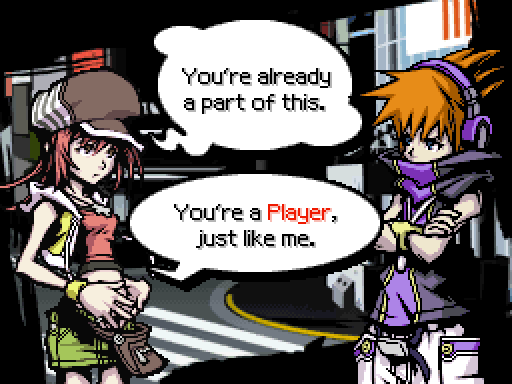 Besides, were partners. Partners work together. : No way! Dont make me a part of this. : A what? Im not playing anything. : Oh yeah? Then why do you have a Player Pin? 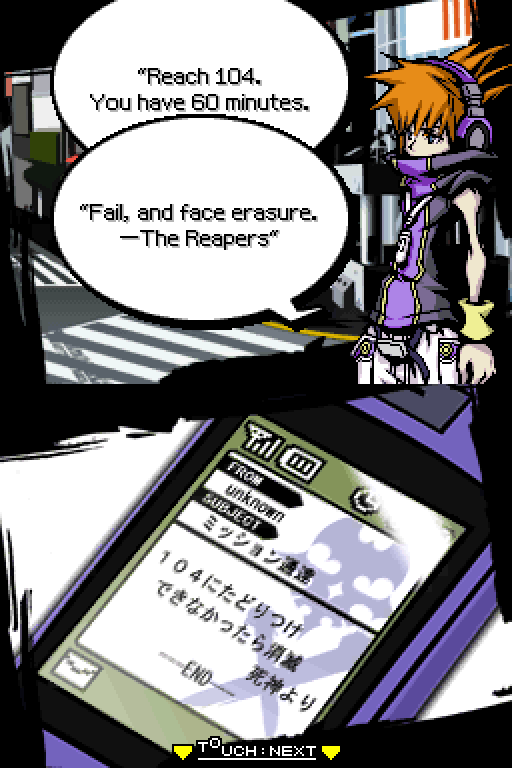 : See, youre part of the Reapers Game, too. : We dont have time for this! The clocks ticking! Weve only got 20 minutes! Lets hurry to Ten-Four! : That junk mail...Please. What kind of nut would believe that? Then again... This day has been pretty weird. And shes gonna follow me anyway... May as well go along and try to figure this out. All right, you win. Lead the way. : Good. Now, for the last time... Tell me your name. So I used it one or two times before he said it. Sue me. 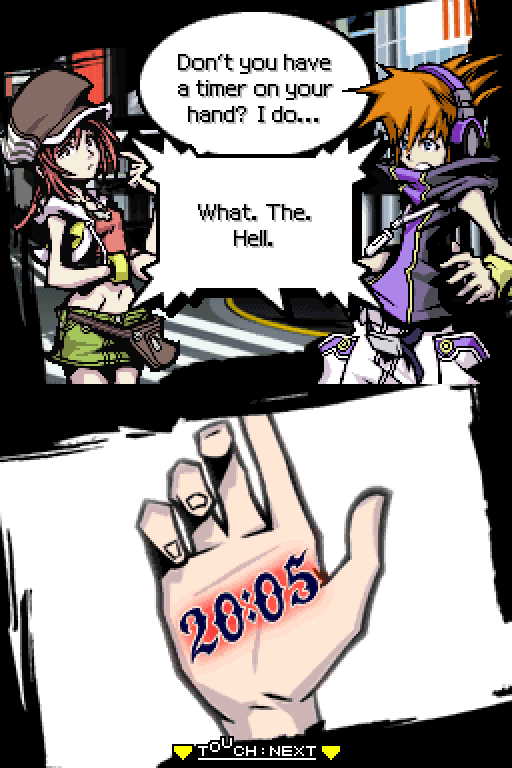 : Neku, huh? Cute name. 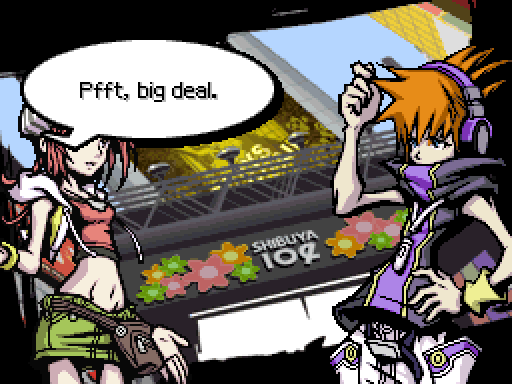 : All right, Neku. Lets go over to 104! If only it were so easy as just running there. : Its blocked! Theres no way past! : We cant get through!? But this is the way to Ten-Four! : ... Why do I feel like Im being watched? That guy over there. Whats he staring at? A deactivating sound is heard. : What are we gonna do about this wall? : Huh? 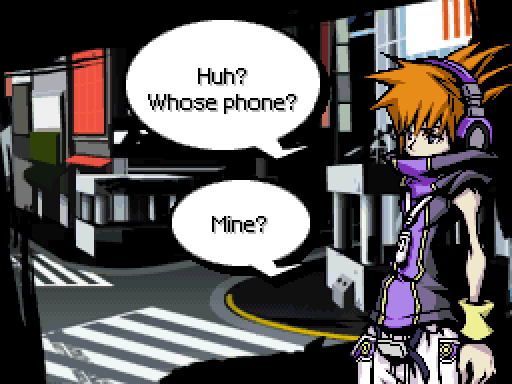 Neku! Its open. : Whats up with that? : No idea. A lucky break, I guess! Cmon, we gotta keep moving. 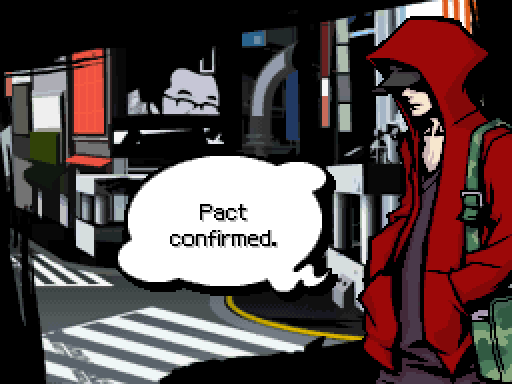 : Something about that guy in red... Huh? Whered he go? Weird. The mysterious voice stays off-screen the whole time, but her giggle is familiar. 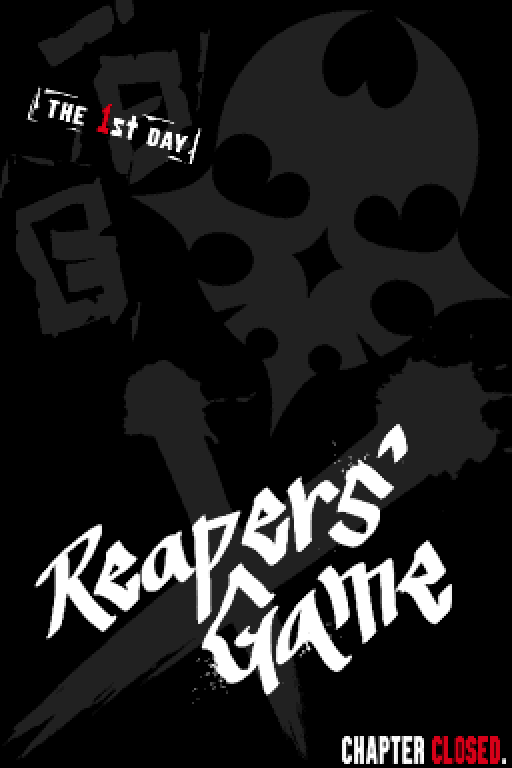 : Only an idiot would screw up on Day 1.
: Oh, no... A Reaper? 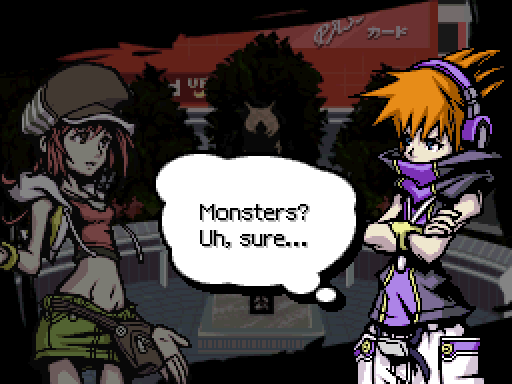 : You two are gonna get erased sooner or later. So come on. Help a girl out and earn me a few extra points, K? : This time focus your thoughts on me! : What!? Fight your own battles! : Please! To fight the noise! 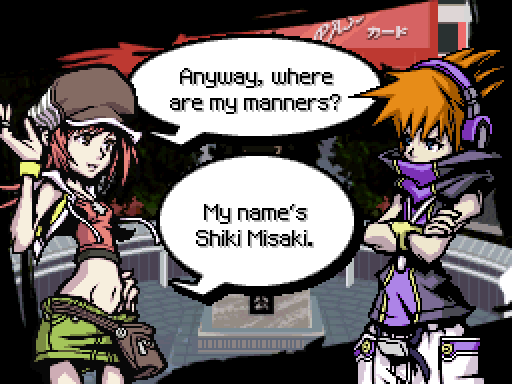 We get control of Shiki, who fights on the top screen with directional or face buttons. So far all she can do is have her cat doll attack by pressing Left and Right (or Y and A) to preform combos. 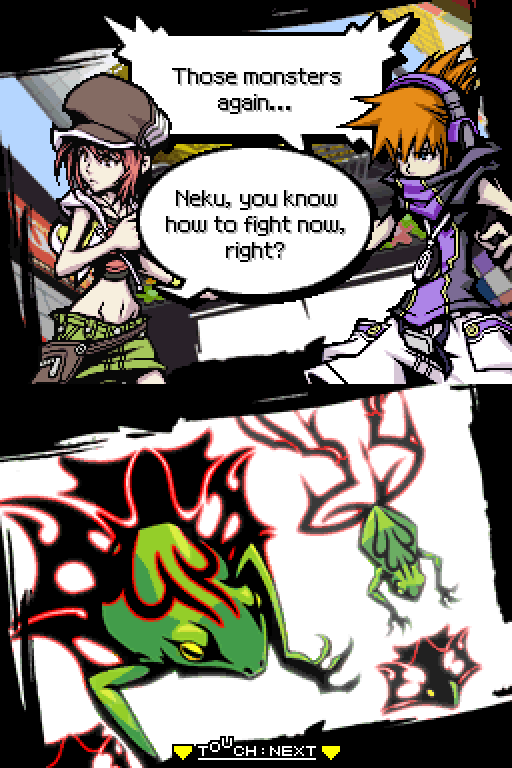 They're much more efficient than Neku's pyrokinesis, and her finisher has invincibility frames, which is how she avoids the Grizzly's swipes. 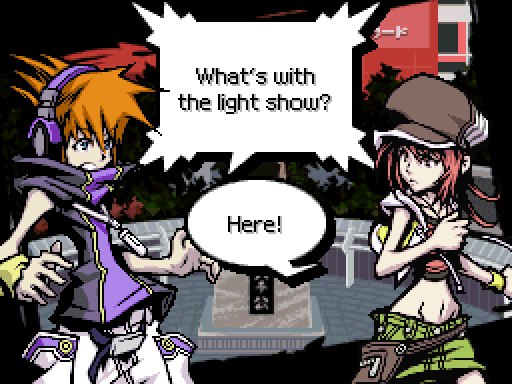 Also we're introduced to the light puck, which gives combo finishers more oomph. The damage numbers with a ! are the ones boosted by the puck, which gives you an idea of how much it helps. Passing the puck a lot boosts the bonus. 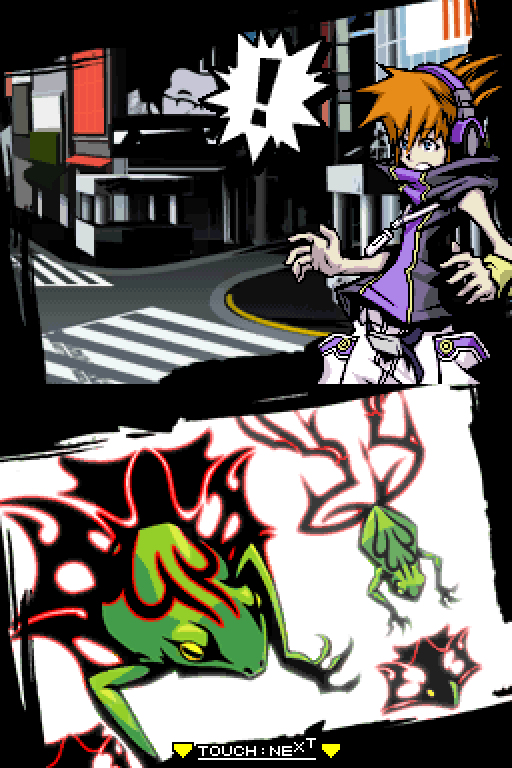 What exactly qualifies as a "finisher" with some of Neku's psychs is a bit ambiguous, considering every hit of pyrokenisis is equal. 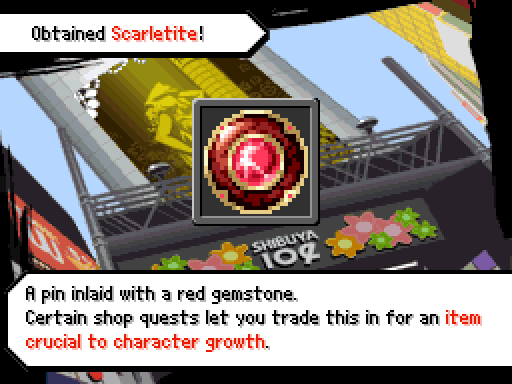 Scarletite is important. Keep it in mind for later. : I cant believe this... Why am I stuck here? What if Im erased!? What the hell kind of game is this? This cant be right. Gaaah! Im really stuck here? In Shibuya! ?